There are many aspects involved in decorating, and G.BORG High Class Painting & Decorating excels in most of them. Based in Ashton-under-Lyne, Lancashire, we only use the finest equipment to achieve a superior end result. 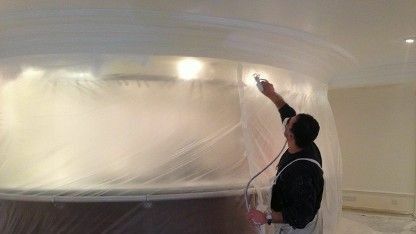 To complete largescale painting jobs, we carry out airless paint spraying using a state-of-the-art spray gun, while we also complete dust-free sanding to keep the air at your premises clean. Additionally, the coating used delivers great penetration into small crevices, and the use of different spray patterns allows the paint to get into even the most hard-to-reach surfaces. A thick, uniform coat is produced with airless spraying, helping to minimise the amount of future resprays you might need. With our high working standards, and years of experience in using airless sprayers, we know what will work best for you, so give us a call today. We hate dust, you hate dust, everyone hates dust – that’s why we have invested in dust-free sanders that remove up to 99.9% of dust. This ensures that the air in the workspace remains much cleaner and healthier, and prevents your workplace or home from having dusty, unclean surfaces and floors. 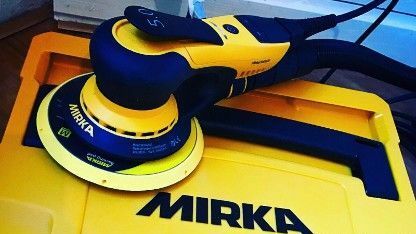 Work is carried out with a Mirka sander that is connected to an extractor that pulls the dust into it, rather than pushing it into the air. The reason we use Mirka sanders is that, in our eyes, they are the best for the job and they offer a superior finish. This is part of our commitment to achieving high-class work.